Farnsworth-Munsell has created a functional magnetic resonance imaging (fMRI) test that may prove helpful in the study of cerebral achromatopsia. The chromatic 100-Hue color vision test is active rather than passive; it uses a new set of hues, and employs more complex color sequencing than previously used in static achromatic Mondrian stimulation tests. 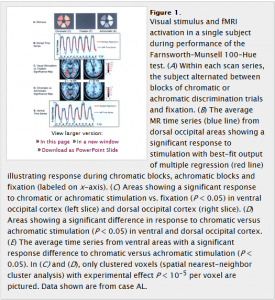 Results of the Farnsworth-Munsell 100-Hue test showed more ventral activity in the brain, and help to confirm the theory that color processing occurs mainly — though not exclusively — in the ventral occipitotemporal cortex. The study further shows that using the active set of hues and color information contributed to more activity seen in anterior color-selective activity. Future studies may help determine how multiple color-selective areas in the brain function collectively to process color information. Learn more about what the 100-Hue Test Reveals about Multiple Color-Selective Areas in the Human Ventral Occipitotemporal Cortex.